1st place – Johnny Gonzo as Haven-Era Dave Katz! Prize – 2 tickets to any 1 Ekoostik Hookah show through the end of 2017 and $50 merchandise gift card. 2nd place – O.J. & Lisa Wilson as Solid Gold Dancers! Prize – 2 tickets to any 1 Woodlands Tavern show through the end of 2017 and $50 merchandise gift card. 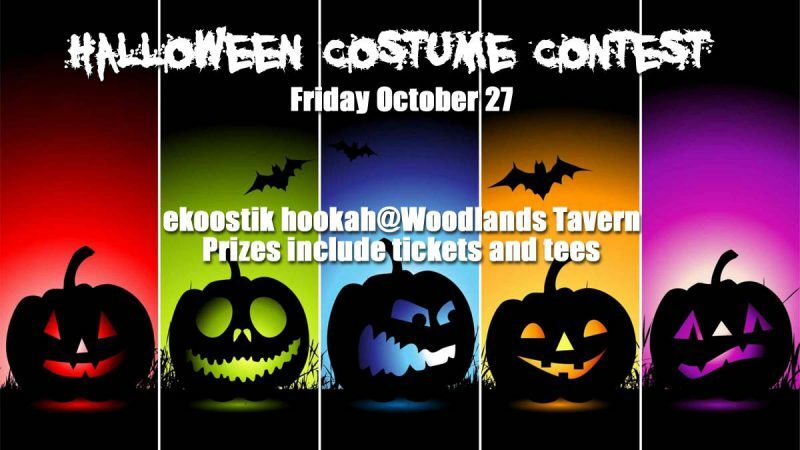 Join us at Woodlands Tavern on Friday October 27th to kick off Halloween weekend with a costume contest! Prizes include tickets to shows (Hookah and Woodlands) and EH merchandise so get something going and show us what you’ve got! We start at 9PM and tickets are $15. Saturday we’re in Covington, KY continuing the fun with The Werks at the Madison Theater and then fall tour continues through November and December. Do you have your tickets for New Year’s Eve yet?? The VIP Suites are already sold out but there are still tickets to the show and the balcony pre-party. We do expect this show to sell out so act fast! Notes: 9PM start, COSTUME CONTEST!